FNDLOAD apps/apps O Y DOWNLOAD $FND_TOP/patch/115/import/afcpprog.lct XXCPNAME.ldt PROGRAM APPLICATION_SHORT_NAME="PN" CONCURRENT_PROGRAM_NAME="XXCPNAME"
2. FNDLOAD apps/apps 0 Y UPLOAD_PARTIAL $FND_TOP/patch/115/import/afcpprog.lct XXCPNAME.ldt PROGRAM CONCURRENT_PROGRAM_NAME="XXCPNAME" APPLICATION_SHORT_NAME="PN"
FNDLOAD apps/apps 0 Y DOWNLOAD $FND_TOP/patch/115/import/affrmcus.lct XXFPNAME.ldt FND_FORM_CUSTOM_RULES function_name="XXFPNAME"
FNDLOAD apps/apps O Y DOWNLOAD $FND_TOP/patch/115/import/afcppstl.lct XXPRSTYLE.ldt STYLE PRINTER_STYLE_NAME="XXPRSTYLE"
1. 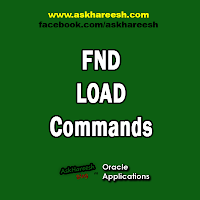 Test FNDLOAD commands multiple times in multiple instances before running into PROD instances. 2. UPLOAD_PARTIAL is used to modify existed programs.